The lightweight, durable, and rugged GBC014 EVA Protective Case has a semi-rigid custom exterior with zipper closures and a reinforced handle. 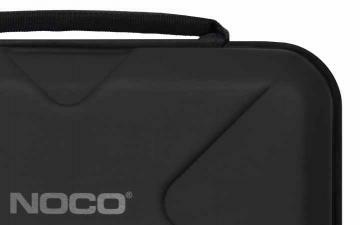 The rubberized EVA exterior offers protection from moisture, impact, dust, and other environmental factors, while the molded interior perfectly fits, stores, and protects its corresponding NOCO Genius UltraSafe jump starter— the GB70 (not included).The GBC014 case has additional pockets for carrying related Boost accessories (not included). Store the protective case easily in your trunk, vehicle, console, or garage. 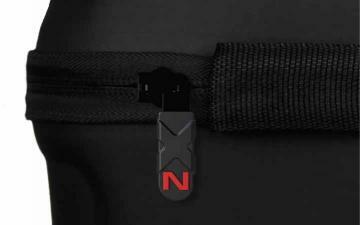 Equipped with a zipper closure and reinforced handle for storing and carrying Boost. 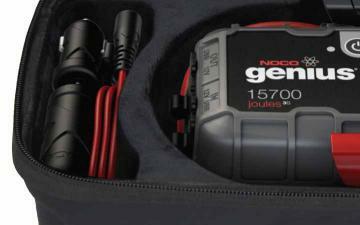 Fits the NOCO Genius GB70 Boost UltraSafe Jump Starters (not included). Perfectly fits your jump starter & more. Carry your Genius Boost, its clamps, and any additional accessories all together in the GBC014 Protective EVA Case (Boost & Accessories sold separately). Made of thermoformed EVA, the GBC014's lightweight and durable molded exterior has a water resistant, rubber-like finish. 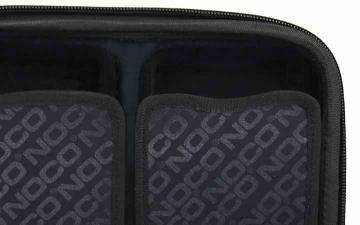 The case is sealed with a heavy-duty reverse coil zipper, a built-in reinforced handle, and custom over-molded pull tabs. The molded tray interior has a soft black melange velvet lining for a secure fit. The reinforced semi-rigid pockets securely hold clamps, extensions or other accessories. Click the button below to add the EVA Protective Case For Boost HD GB70 to your wish list.